A number of theories might explain the observed phenomenon of lower sperm counts, lower sperm quality such as poorer motility (the ability of sperm to move properly toward an egg) and morphology (the normal shape and appearance of sperm cell structures), and higher levels of sperm DNA damage. As is commonly known, heat is bad for sperm. The testicles are supposed to be two degrees cooler than core body temperature for sperm production to proceed normally. In obese men, the extra fat tissue in the groin and thigh areas insulates the testicles and elevates their temperature, negatively affecting the quality and quantity of sperm. 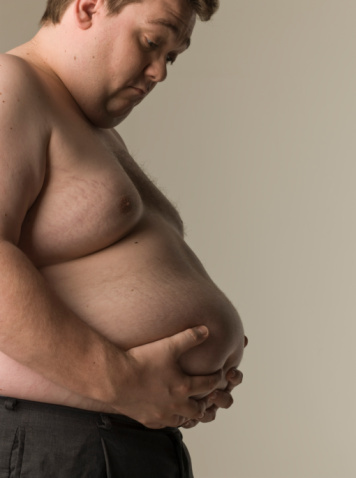 Obese men also tend to suffer from hypogonadism, a condition in which the body doesn’t produce enough testosterone. They can also have elevated levels of female hormones; total estrogens and estradiol. Peripheral fat tissue already contains high levels of the enzyme aromatase, which converts testosterone to estrogen. This effectively lowers the already low testosterone levels in an obese man and raises his estrogen levels. The abnormally high estrogen to testosterone ratio negatively impacts the testicles and thus, lowers sperm production. Several treatment strategies may be used to help obese men improve their sperm and fertility. First, healthy diet and exercise can reduce BMI. Sometimes, especially in men who are considered severely obese (a BMI of 40 or above), more aggressive methods may be necessary to lose weight, such as gastric bypass or other types of bariatric surgery. Medications like testalactone or arimadex can be used in an obese man to lower the production of female hormones, raise testosterone, balance his hormone levels overall and ultimately improve his sperm quality and production. Metformin, a drug used to treat diabetes, has also been shown in one study to help sperm production. Some but not all studies have shown weight loss and correction of hormonal issues improves fertility but much more research needs to be conducted in this regard. In all things related to fertility, the best possible hope for conception is early intervention and advice from an expert in the field.